Coming from Windows administration, I want to dig deeper in Linux (Debian). One of my burning questions I could not answer searching the web (didn't find it) is: how can I achieve the so called "one-to-many" remoting like in PowerShell for Windows? I get the result. For an environment of 10 servers I would have to write a (perl/python?) script sending the command for each of them? I type my command and with "invoke-command" I can "send" this to a bunch of servers (maybe from a textfile) to execute simultaneously and get the result back (as an object for further work). I can even establish multiple sessions, the connection is held in the background, and selectively send commands to these sessions, and remote in and out like I need. With Rex(ify) you can do adhoc command and advance it to a real configuration management (...meaning: it is a CM in first place, but nice for adhoc tasks, too) The website seams outdated, but currently (as of 01/2019) it's in active development and the IRC-Channel is also active. ClusterSSH is a Tk/Perl wrapper around standard Linux tools like XTerm and SSH. As such, it'll run on just about any POSIX-compliant OS where the libraries exist — I've run it on Linux, Solaris, and Mac OS X. It requires the Perl libraries Tk (perl-tk on Debian or Ubuntu) and X11::Protocol (libx11-protocol-perl on Debian or Ubuntu), in addition to xterm and OpenSSH. The Playbooks are more elaborate than the command line options. However, to start using Ansible you need a simple installation and to setup the clients list text file. The output also is very nicely formatted and separated per rule/server, and while running it in the background can be redirected to a file and consulted later. You can start with simple rules, and Ansible usage will get more interesting as you grow in Linux, and your infra-structure becomes larger. As such it will do so much more than PowerShell. It also has many modules defined that let you easily write comprehensive policies. Ansible is also widely used, and you will find lots of projects in github, like this one from myself for FreeRadius setup. While Ansible is a free open source framework, it also has a paid web panel interface, Ansible Tower although the licensing is rather expensive. Nowadays, after RedHat bought it, tower has also the open source version known as AWX. As a bonus, Ansible also is capable of administering Windows servers, though I have never used it for that. It is also capable of administering networking equipment (routers, switches, and firewall), which make it a very interesting solution as an automation turn key solution. Yet again, for a remote framework easier to use, but not so potent as Ansible, I do recommend Rundeck. It is a very powerful multi-user/login graphical interface where you can automate much of your common day-to-day tasks, and even give watered down views to sysops or helpdesk people. 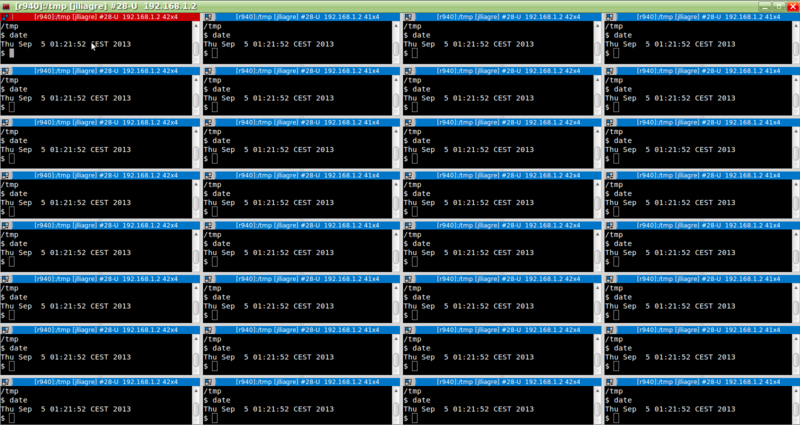 When running the commands, it also gives you windows with the output broken down by server/task. It can run multiple jobs in the background seamlessly, and allows you to see the report and output later on. 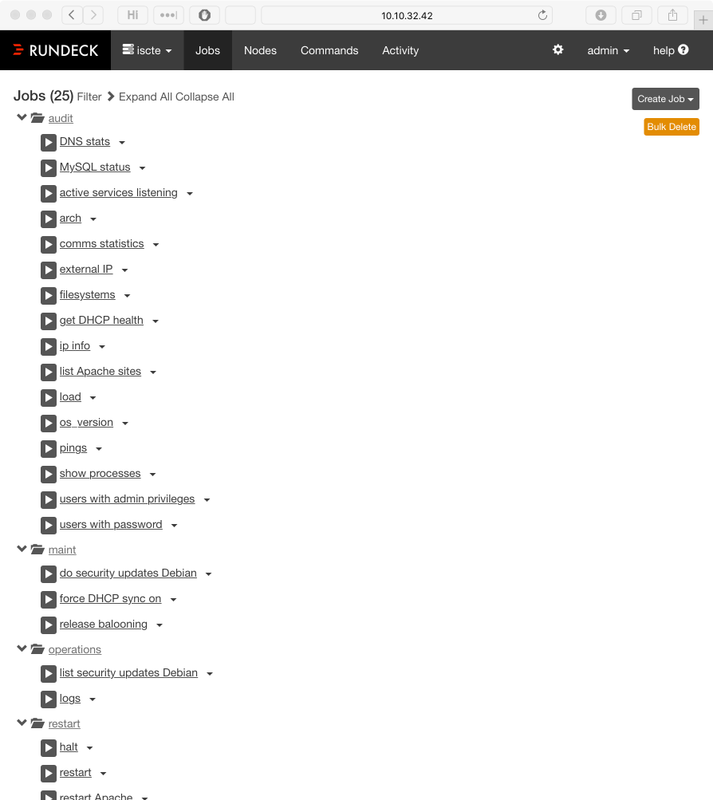 Please note there are people running Ansible+RunDeck as a web interface; not all cases are appropriated for that. It also goes without saying that using Ansible and/or RunDeck can be construed as a form or part of the infra-structure documentation, and over time allows to replicate and improve the actions/recipes/Playbooks. Lastly, talking about a central command server, I would create one just up for the task. Actually the technical term is a jump box. 'Jump boxes' improve security, if you set them up right. If you want to do it interactively, you can use terminator which allows to broadcast a command to multiple terminals. See: How do I run the same linux command in more than one tab/shell simultaneously? If you're using KDE, here's another method. - Open a Konsole window. In the "Edit" menu, select "copy input" to "all tabs"
Every command you enter in that tab will be copied to all servers. You can switch from tab to tab to look at the different results. It allows simple one-liners with saved settings, so you can create a profile, "prod', which will contain a server list and common switches. Then just add the command you want, and you are ready. It also can copy files to the server and automatically delete them at the end, and it's pretty convenient for even bigger scripts. Also it is very fast. The only problem is that it has so many options ;) But the documentation also includes a lot of examples, so you can just look at them in the beginning. Not the answer you're looking for? Browse other questions tagged linux ssh perl remote-management rex or ask your own question. How to install package in 86 hosts in the same time (RHEL)? Can I ssh to a server through a pptp tunnel?